A Shared Parenting Act was introduced by Rep. Jim Runestad in the Michigan Legislature that would give divorced fathers shared custody and equal parenting time with their children as mothers. "Divorced fathers are devalued, disparaged and forcefully disengaged from their children's lives,' asserts Dr. Edward Kruk, who leads Co-Parenting After Divorce. "Researchers have found that for children, the results are nothing short of disastrous." Some 71% of high school dropouts are fatherless and 85% of youth in prison have an absent father. His bill would grant "shared custody and substantially equal parenting time as a starting point in custody deliberations." The couple could agree to a 60-40 or 70-30 split of time, but would begin with a 50-50 assumption, not the 92.5% - 7.5% assumption of most divorces. Children need both parents in an intact marriage. If there is a divorce, children still need both parents. 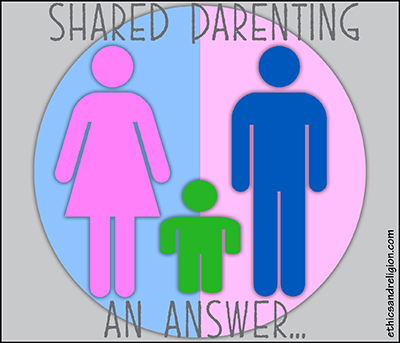 Shared Parenting is a major answer, which has been passed by Arizona, Kentucky and Missouri. A Michigan House committee passed Runestad's bill, and he expects a positive vote this fall in the House. Prospects look good in the Senate. The Lt. Governor introduced a similar bill. Children feel abandoned when their fathers are not in their lives, and struggle with fears, episodic bouts of self-loathing (sparking excessive suicides). "They are more likely to exhibit behavioral problems, have difficulties making friends, and many develop a swaggering intimidating persona in an attempt to disguise their underlying fears, resentments, anxieties and unhappiness," reports Dr. Kruk. This emotional turmoil leads to poor academic performance and truancy. Some 71% of high school dropouts are fatherless, which leads many to delinquency and crime. They are also more likely to go to jail as adults. Runestad's bill would call on parties who oppose shared parenting to prove that such an arrangement is harmful to children. He says, "Proving harm is not an onerous requirement, considering that we are talking about parents being stripped of their most basic parental rights." In Michigan alone, more tha a half million children live in a home without any male presence. "We have a post-divorce child custody system that systematically creates thousands of fatherless homes every year," Runestad asserts. However, his bill has met stiff opposition from a wide swath of groups including the Michigan Coalition to End Domestic & Sexual Violence, the National Association of Social Workers and the Michigan Judge's Association Family Law Committee. Rebecca Shiemki, a family law attorney with the Michigan Poverty Law Program, said the current law is working and what's being proposed would take the focus off the child. "Establishing presumptions really remove the focus in child custody disputes from what's best for the child to a parent's right to equal time with their child." The Michigan Supreme Court looked into the issue and found that in 2013. Only 7% of divorce cases awarded the father full custody while mothers won full custody in 51% of cases. In 40% of cases, parents were awarded joint custody. However, in practice, that meant the father had only two overnights with the child every other weekend. How can it be "what's best for the child" for full custody to be awarded to either parent? One need only look at the data. In 2015 Census reported there were 1,159,000 divorces compared to only 2,077,000 marriages. That's a 53.4% divorce rate. Since 1975 there has been one divorce for every two marriages - for four decades. The major reason for America's sky high divorce rate is that every state has passed "No Fault Divorce," in which one spouse declares there are "irreconcilable differences," though 80% of their partners disagree. In the old days, a spouse had to prove their partner was guilty of a major fault - adultery, abuse, abandonment. No Fault erased protection of the innocent and awarded custody to destroyers of marriage. Children of divorce are the losers. They are three times more likely to be expelled from school or to have a child as a teenager - as those from intact homes, and are five times more likely to live in poverty, six times more apt to commit suicide, and 12 times more likely to be incarcerated. Shared Parenting offers those kids a new green light of hope.